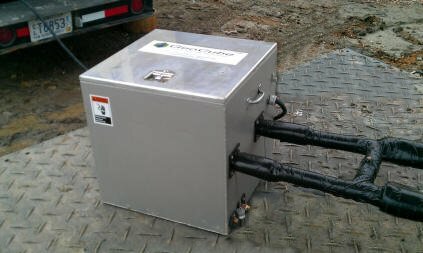 The GeoCube is designed to be a trouble-free tool in the field and the test results are intended to be easy enough to use by operators with all of the detail necessary for Engineers to confidently use the test results as part of modeling a geothermal system. The questions below encompass the majority of the inquiries that we receive before, during and after the sale of the GeoCube. If you need something that we don't cover here, please contact us. What are the different models of GeoCube? What is a data logger and how is it used by the GeoCube? Can we see examples of different GeoCube configurations? What is the accuracy of the GeoCube? Why are there different data logger choices? What test standards are used by the GeoCube to determine TC/TRT Data? Why do I have to run tests for 40 hours? Can't I perform shorter tests that are just as accurate? Can the GeoCube perform TC/TRT tests in all times of the year? Do I have to use special grout for the test borehole to get good TC/TRT data? My application is for deeper borings than 700 ft. Will the 700 foot model still work for a deeper borehole? I want to use shore power instead of renting a generator. Why is that not recommended? Does it make any difference if I use plain water instead of an anti-freeze solution? It gets very cold at night and hot during the day. Don't I have to keep the GeoCube in an insulated trailer? Can I use a 60Hz model with 50Hz power? Does the Conveniece Panel Meter Tell Me if the Logger is Operating? What can go wrong with a GeoCube? Do I have to recalibrate my temperature sensors periodically? The driller was not careful and introduced mud and gravel into the loopfield. How can we protect our GeoCube? I've run a test but am having problems with my computer. Can Precision assist with TC test reports? I'm Interested in using the Remote Data Logging. What do I need to know to make it work? Is the TC/TRT analysis software available on a standalone basis? Can we see examples of what happens when TC tests are disturbed or not set up properly? What are the different models of the GeoCube? The GeoCube is offered in three standard configurations plus an extended range model that varies based on the depth that the unit can serve. The depth capacity (400'/120m, 500'/150m, 725'/220m, 850'/260m) is determined by the pump, other hardware, heating elements and electrical system design that are associated with each model. The heating capacity is determined by the amount of power that needs to be injected per foot, per ASHRAE guidelines. By design, The GeoCube is able to inject 15-25 watts/foot or 49-82 watts/meter of borehole for the model that is selected. The user can select from multiple heater powers to supply the appropriate power to deliver the heat injection for their specific test borehole. The extended range model is available with all of the same logger configurations using a larger capacity heat exchanger and additional heating elements to allow testing of very deep boreholes. The time of year does not have a direct relationship to vertical borehole TC/TRT test. The GeoCube is internally insulated to minimize impact on the circulating liquid so as not to be heated or cooled by changes in ambient temperature. The loopfield lines always should be insulated to prevent the loopfield lines from directly exchanging heat with the air. The GeoCube also may be blanketed if desired although the GeoCube does not require additional insulation.. The data analysis takes into account the heat energy from the heating elements and the circulating pump to determine the thermal conductivity/thermal response results. In other words, the thermal conductivity/response data will accurately reflect the borehole and surrounding soil characteristics regardless of the time of year. In colder climates, an appropriate antifreeze solution may be necessary to prevent freezing of the liquids when the test is being setup or when the test is being taken down. The surface temperatures have essentially no short term effect on boreholes that are deeper than 30 feet, so it is only important to take care of pipes or liquids which are exposed at the surface. In subfreezing temperatures, it will be necessary either put antifreeze into the loop or drain to sufficient depth to keep the liquid below the frost line when the test is completed. In North America, ASHRAE guidelines are the accepted standard for determining the thermal conductivity of a borehole. 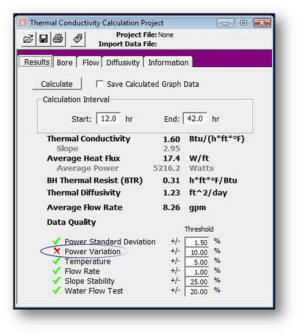 The data analysis that is used by the included software (GLD) is based on the line-source analysis methodology described in ASHRAE 111-8TRP and specified in the ASHRAE 2007 HVAC Applications Handbook - Chapter 32.12-32.13 The software produces a report that provides working definitions and explanations of how the data are analyzed and used. The standard test accurately (and optionally) will estimate the undisturbed loopfield temperature and will calculate the soil thermal conductivity of the loopfield. Tests typically are a minimum of 40-60 hours in duration., During the initial 12 hours of the test, heat from the GeoCube fully saturates the borehole, which provides data for determining the Borehole Thermal Resistance. During the remainder of the test, heat radiates out from the saturated borehole and provides data for thermal conductivity determination using the previously mentioned standard line-source method. Precision Geothermal has published a paper titled, "What to Look for in Thermal Response / Conductivity Test Services". This document describes procedures, standards and recommendations for performing Thermal Conductivity / Thermal Response (TC/TRT) testing. The GeoCube and related software provide data which may be analyzed by other methods. Precision Geothermal uses industry adopted theory for analyzing the test data and any other analysis methods employed will need to use software or methods not supplied by Precision Geothermal. Do I have to use special grout in the test borehole to get good TC/TRT data? An experienced driller understands the importance of grouting boreholes and it is a requirement of IGSPHA and NGWA. This answer is intended to respond to the need for a "special" grout when doing TC/TRT testing. The borehole may be any size that is appropriate to drill and the borehole should be grouted with material that is suitable for the project. A typical TC/TRT test will try to simulate exactly what will be used for the future loopfield so that the test boring can be incorporated into the production system. The thermal conductivity testing results are not affected by the borehole, since the TC/TRT. result is a measure of the thermal characteristics of the earth surrounding the loopfield and not the borehole itself. The testing analysis will disregard the first 12 hours of data as the borehole and loop piping heats up and thermally saturates. For the purpose of the testing, a borehole does need some kind of grout because air gaps between the pipe and borehole will effectively insulate the pipe from the borehole, which will likely devastate loopfield performance. The TC/TRT test does not test the borehole, the loop pipe, the grout or the type of fluid that is used. A TC/TRT test is testing the thermal characteristics of the earth that surrounds the borehole. The type of grout does however effect the "borehole thermal resistance" which also is calculated from the test and should be representative of the production loopfield design for the project that is being planned. Good commercial loopfield design software can utilize both the Thermal Conductivity / Thermal response data AND the Borehole Thermal Resistance data from a test loopfield. What is a data logger?? A data logger is an electronic instrument that records measurements such as temperature, voltage, pressure and events over time. Typically a data logger is a small, battery-powered device that is equipped with a microprocessor, data storage capacity and sensors. Most data loggers utilize purpose specific software on a PC to start the logger and view the collected data. Data loggers are used in remote areas or anywhere you need to record measurements using a compact, convenient, self contained and battery powered unit. They are ideal for field studies, monitoring, testing and general research. The data logger in the GeoCube eliminates the need for a full PC system to be dedicated to the test site and allows data to be shuttled between the test and the user's computer by means of a physical shuttle or through GSM telemetry to an internet data site. The GeoCube data logger records data for the date and time; generator voltage; current; entering and return fluid temperatures; fluid flow rate; logger battery status. The GeoCube comes with software to download the datalogger readings in a CSV file and a custom software module from GAIA Geothermal that can analyze the data on any Windows based PC. This module can read the data logger data and present a time analyzed output which documents the test conditions and outputs with test conclusions for use in geothermal loopfield designs. This data also can be analyzed using a text or spreadsheet program if so desired. The datalogs may be recorded in either imperial or metric units. The data logger is specifically matched to the sensors in the GeoCube. 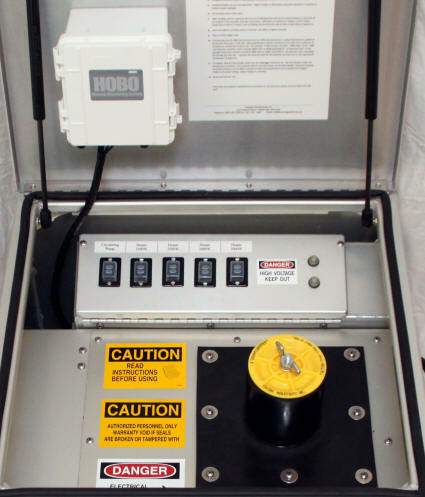 Owners of the GeoCube™ thermal conductivity tester and customers that lease a GeoCube thermal conductivity testing unit, may optionally contract with Precision Geothermal, LLC for services related to the retrieval and processing of data for an individual TC Test. Generally, a customer is able to do their own data retrieval and processing with the provided tools. We understand that there are situations which may be related to customer computers, users or operation that may require assistance beyond regular support. In these situations, Precision Geothermal, LLC will provide, at an additional charge, assistance to retrieve and process the data from a customer test. This service is NOT design assistance and is NOT intended to substitute for individualized analysis of geology, test conditions or evaluation of test data for varying subsurface conditions in potential loopfield locations. In short, Precision Geothermal can assist when the need arises. The customer is ultimately responsible for their own TC Test but we can assist with the nuts and bolts of retreiving data and generating the test report. Reliable cell service is necessary for the remote exchange of data. Not all areas have good cellular data coverage. The use of the HOBOLink data service is the responsibility of the customer for service after the first year. Precision Geothermal will set up your account and the first year is included in the purchase. Subsequent service after the first year is the responsibility of the GeoCube customer. The launch of the data logging and the logging configuration is performed via the web and requires that the operator have the necessary equipment on site to launch and configure the test. An alternate method requires the person that is operating the test to be in contact with someone at their home base to launch the data logging and to do the test configuration. This procedure could be considered to be more complicated than running the test with a non-telemetry logger but is the choice of the company that is running the test. The GSM Data Logger option does NOT provide the ability to make any adjustments during the test. The web site can communicate with the GSM Data Logger but it cannot be used to make adjustments to heaters, pump operation or etc. The GSM Logger needs to be charged to maintain communications for the duration of the test. If you operate a cell phone, you already understand the importance of having a full charge on your battery. The variability of the job site power is generally not condusive for a "universal" charging solution. The GSM data logger is a powerful tool for those that must be able to remotely monitor their test data. Precision Geothermal provides data analysis software for the GeoCube that is from the GLD Geothermal Design Suite. The TC/TRT Module as a standalone is available through Thermal Dynamics, the distributor for GLD Software. The software will natively work in imperial or metric units. If you can work with a simple spreadsheet, then you can use GLD for TC Report generation. My application is for deeper borings than 850 ft. / 260m. Will the 850 ft. / 260 meter model still work for a deeper borehole? The limitations for the borehole depth involve the pump and thermal injection. The 850' / 260 m extended range model unit cannot provide enough thermal injection to meet ASHRAE standards without modifications to go beyond 850', but most North American applications do not require greater depths. Precision Geothermal has manufactured special units that can go to 1,000 feet / 305 meters. If you have a need for depths greater than 850 feet / 260 meters, please send us a note with your requirements using our web contact form. We will contact you to discuss the specifics. A successful TC/TRT test requires reliable, consistent power in order to maintain data validity. "Shore Power" or commercial power can have variations of up to 20% in normal operations. Utilities deal with wide ranges of load conditions and it is not uncommon to see brownouts in the system or power surges that will invalidate the data for your entire test. 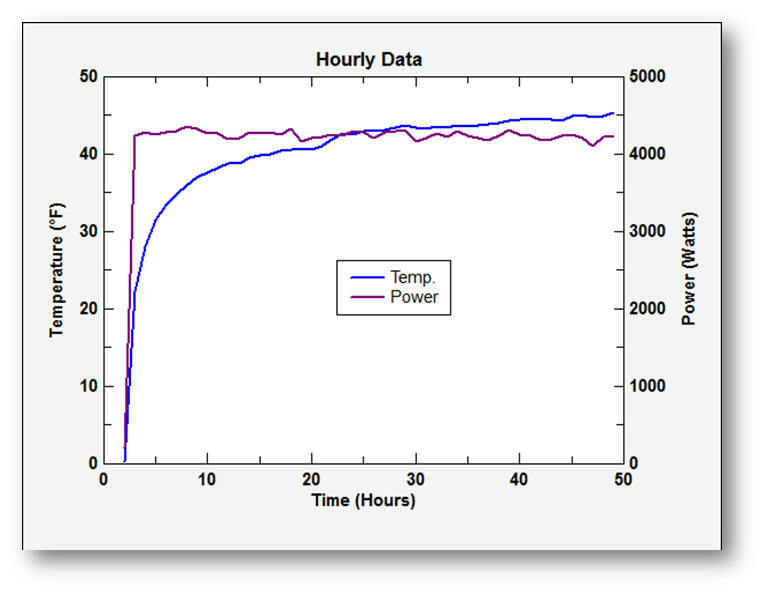 Below find a report dialog from using an "unstable" power source that has exceeded the +/- 10% threshold that was set for the test: The graph clearly shows the instability and the resulting "wobbles" in the temperature. Results like this are clearly unacceptable. We recommend using a diesel powered generator that is 2X the load for most optimal results. Based on the standards from ASHRAE and IGSHPA, a proper test must maintain a maximum +/- 1.5% power input standard deviation from the average power level. Peak variations must be kept at less than 10% of the average power level. Can I use a 60Hz unit with a 50Hz power source or vice versa? No, the GeoCube is designed and shipped to use a specific type of power source. Pumps are designed to run at a particular frequency as well as a specific voltage. The RPM of an induction motor is based on the frequency of the power source. GeoCubes are shipped with heating elements that are specifically rated to produce a specific wattage at their design voltage. While a GeoCube may operate at a higher/lower voltage or higher/lower frequency, our ratings are for specific components to be used in the conditions that they were designed for. The GeoCube can use plain water or an antifreeze solution. The T.C. test results will not be affected if the environment calls for a solution that involves propylene glycol or ethanol (for example). The GeoCube will maintain adequate flows with antifreeze solutions and the mathematics used to determine the TC value are not affected by whether the test is run with water or antifreeze. If the testing is being conducted in cold climate conditions, steps should be taken to insure that freezing does not occur in the exposed loopfield piping or the GeoCube. Normal ground temperatures will protect the standing liquid below the surface. Exposed portions of the pipe should be protected with antifreeze or kept dry before and after the testing is completed. The GeoCube should be drained completely between uses. Standards for thermal analysis of the earth surrounding a borehole have been developed over the years by studies which have been used by organizations like ASRAE and IGSPHA. These empirical tests have been established to provide a meaningful and consistent test that does not attempt to extrapolate data beyond the norms that have been established. A typical borehole and surrounding formation takes 12-20 hours to saturate at the rate of heat injection that is used. 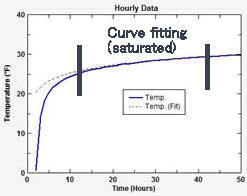 The TC/TRT value is based on finding a "steady state" slope of the temperature curve once saturation is achieved. Testing equipment such as the GeoCube and testing organizations that provide TC/TRT. tests as a third party service are not creating the science but are following the accepted standards. While shorter tests will provide data, the results may not be acceptable by an engineering firm that must use the data to do a project design In addition to the duration of the test, the test also must be continuous and may not be stopped and restarted without waiting for a minimum of (5) days for the earth to rreturn to its native, undisturbed state. Test operators are well advised to take precautions to make sure that generators have sufficient fuel to last the entire duration of the test since any interruption likely will require the test be completely re-run. For a summary of recommended conditions, please view our published guidelines: "What to Look for in Thermal Response / Conductivity Test Services"
Note: There have been papers published in Europe suggesting that there are "electrical response method" tests which can do the same job in less than an hour. At this time, the industry accepted standards which actually measure and observe a physical heat exchange are still the trusted method. With the GeoCube, everything needed to produce a reliable and accurate test is provided along with the peace of mind that TC/TRT test will produce accurate results without any additional exotic equipment or reliance on others to interpret your data. Some users build their GeoCube into an insulated trailer. Most users that are looking for portability and flexibility do not. Keep in mind that direct sunlight which impinges on the GeoCube or especially on uninsulated connecting pipes can influence the test readings, much like a car that sits in the hot sun. While we internally insulate the GeoCube with a minimum of 2" of Formular® 250 insulation to shield the sensors and piping to minimize the influence of outside temperature swings, an insulating blanket or shading can help further minimize the effect. The exposed loopfield piping, if uninsulated, is a larger source of temperature variation than the GeoCube. Exposed pipes should be always be fully insulated and only the shortest necessary amount of pipe to make the connections should be used. The photos below show GeoCubes in operation with insulation applied. If available, a thermal blanket such as used in construction may be used to cover the pipes for maximum protection. Insulation of the connecting pipes in ALL climates and seasons is the correct way to run conductivity/response tests. It is always prudent to protect the unit from direct solar radiation during the test. What are examples of test results that show problems with the setup and operation of the GeoCube? This is an example of a test that has completed properly. Flow and Temperature plotted. Note issues leading up to hour 18. User introduced additional water into the pump well. Loop was likely not purged properly prior to starting the test. Flow rate changed around 30 hours into test. Likely air bubble. Power and temperature plotted. Generator is poorly regulated. Uninsulated loop pipes exposed to direct sunlight. Causes a small bump in the temperature profile. Properly run test in borehole with flowing water. Note the temperature delta from undisturbed is about half of what is expected in a normal test. The GeoCube is offered in three standard configurations plus an extended range model that vary based on the depth that unit can serve. The depth capacity (400'/120m, 500'/150m, 700'/220m, 850'/260m) is determined by the pump and heating elements that are associated with the model. These units appear to be very similar from the outside and are the same physical size. The Extended Range GeoCube has an external access panel to the heaters. The heating capacity is determined by the amount of power that needs to be injected per foot, per ASHRAE guidelines. The GeoCube is able to inject 15-25 watts/foot or 49-82 watts/meter of borehole for the model that is selected and the user can select the appropriate power to deliver the heat injection for their specific test borehole. Our model ratings are based on 60Hz units with 240v available. 50Hz unit heaters are slightly derated. The pumps, electrical system and thermal elements are sized appropriately for the model of the GeoCube. A high capacity GeoCube may be used for shallower boreholes without any problem by selecting the appropriate power levels with the standard controls available in the unit. While all three units have the same external configuration, customization options, including multiple finishes, connections and multiple data logging options, are available. All units share the same reliability levels for the basic functionality. Units with the Advanced Data logger feature offer extra protection for the electronic logging unit due to the waterproof internal housing for the electronics. Units that have the anodized chassis will retain their "new" appearance for a greater percentage of their lifetime and can stand up to everyday wear and tear to a greater extent than the polished finish of the standard unit. While the anodized chassis adds extra production to the unit, the performance is 100% the same as the standard finish. The anodized unit (below right) also shows the optional "H" valve assembly, which facilitates reliable start up and tear down by allowing the loops to be fully purged and filled. By reliably eliminating air from the test loop, you protect the integrity of the test and prevent accidental damage to heating elements which could be prematurely damaged by dry operation. Redundant data sensors are available for every configuration and provide peace of mind during the critical hours of test operation. All redundant measurement channels operate independently and provide a fail-safe for malfunction of any individual data logger channel or unit sensor. This is an internal feature of the GeoCube and is not visible from the outside of the unit but is evident in the additional data points that are collected during the testing. Our current software has built-in testing to automatically select sensor pairs from the test data in the event of any sensor failure or disconnection during a test. The Advanced Data Logger option with GSM telemetry requires no external antenna and is fully protected inside of the locked housing. This option provides for real-time remote reading of data from your GeoCube during any test conducted in a location with cellular coverage. All loggers collect and store the full data set even if the coverage of the GSM is weak or spotty at the project site. Why are there different types of data loggers for the GeoCube? The loggers in all GeoCubes collect digital data that are stored in flash memory inside of the logger. The standard data logger can store multiple tests and can stay in the unit for extended periods of time for later retrieval. 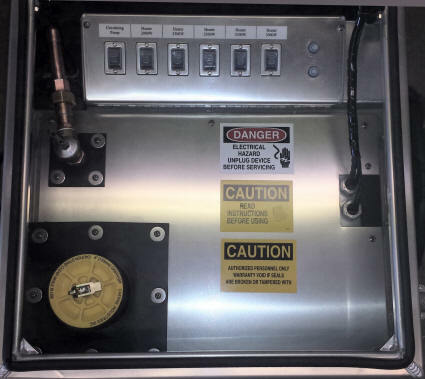 Since a TC/TRT test involves routine handling in outside environments and with exposure to liquids, some customers prefer to minimize accidental exposures to moisture. The Advanced Data Logger offers a waterproof housing internal to the GeoCube as well as the ability to provide optional telemetry for projects that require real-time readouts of data points. The GSM option for the Advanced Data Logger provides for communication via commercial cellular coverage and data are received by an FTP site for viewing over the web. There are no exposed antennas visible on the GeoCube, which protects the logger unit and eliminates unnecessary attention when the unit is unattended in the field. The subscription service that comes with the GSM logger option provides for secure, backed up data storage that can be read from anywhere in the world. Does the Convenience Panel Meter Tell Me if the Logger is Running? The convenience meter in the panel is for user "CONVENIENCE". While it provides accurate information regarding the power from the generator and the operation of the GeoCube heaters, it is NOT connected to the data logger and does NOT reflect what is happening with the data logger. The data logger and the convenience meter are totally independent of each other. All tests and logging operations must be started using the data shuttle or the logger. 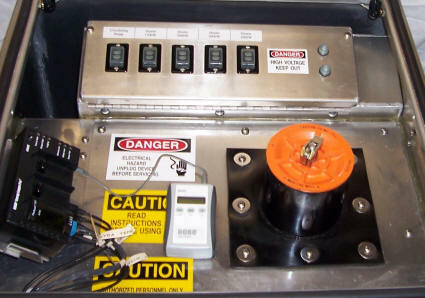 The convenience meter was a user requested feature for quick monitoring of a test after the data logger has been properly set up and launched. The GeoCube utilizes a data logger system with sensors that have been tested and approved for the particular logger included with the GeoCube. Depending on the model of the sensor, there will be several types of sensors that are applied in different locations within the unit. Units that employ redundant temperature sensor sets will have multiple sensors that measure loop temperature in multiple locations within the GeoCube. Our sensors exceed the requirements of ASHRAE and IGSHPA standards. Note: The primary and redundant sensors will NOT read the exact same temperatures due to their mounting locations and initial calibration from the factory. They will exactly track temperature variations to provide a fallback in the event of sensor failure, data channel failure or momentary bubble in the fluid path. Do I have to periodically recalibrate the GeoCube temperature sensors? The simple answer is NO. This is by design of the GeoCube and a frequent question from users. 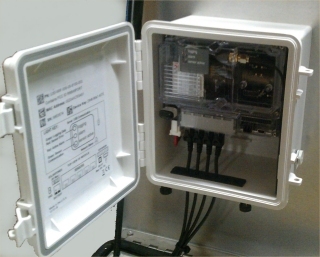 The GeoCube utilizes RTD type sensors that are specifically matched to the model of datalogger that is installed in the GeoCube. The RTD sensors are guaranteed to maintain drift accuracy during their operational life and the exact same sensors are also used in other applications that are temperature critical, such as FDA certified tracking and traceability. 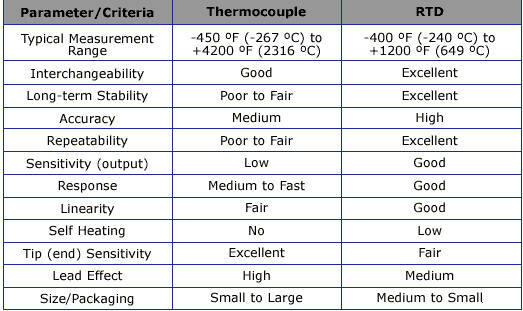 Other TC/TRT test systems often use thermistor or thermocouple type sensors. The advantage of the RTD sensors that are used in the GeoCube is that they have incredibly stable drift characteristics compared to thermistors or thermocouple sensors. In our application, the main disadvantage of the RTD sensor is that they can cost 10x to 50x more than thermistors or thermocouples. The GeoCube designers chose to use the RTD type sensors because they do not drift, have a wide operating accuracy range and because the TC calculations are based on the delta T between the supply and return and not the absolute temperature. The critical temperature is between the sensors. The GeoCube is intended to be user-friendly, reliable and only require minimal service to guarantee accurate test results. Each temp sensor is electronically matched to the data logger, serialized for traceability and is highly accurate. The sensor is either good or bad. There is no drift. Note: As described above in the accuracy section, the primary and backup sensors will NOT read the exact same temperatures due to their mounting locations. 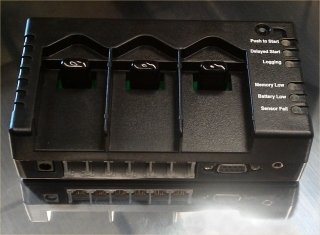 They will exactly track temperature variations between pairs to provide a fallback in the event of connector failure or loss of channel data in either pair. Quite simply, the most likely thing to go wrong with the GeoCube itself is damage caused by improper operation. The internal components have been selected for accuracy, reliability and rugged use in the field. The mechanical parts most vulnerable to user-induced damage are the pump and the heating elements. Introducing mud and gravel into a loop will kill most pumps. 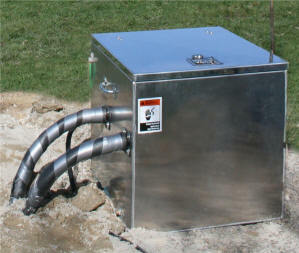 GeoCubes shipped after November 1, 2011 contain a stainless mesh filter in the standpipe assembly to catch the unknown sediment or gravel that have inadvertantly found their way into the loop pipe. Units with the 4" standpipe that were purchased prior to November 2011 can use the new filter, which is available as a replacement accessory. The mesh filter protects both the pump and the flow meter. Accidently restricting flows to the heaters inside the GeoCube will cause the high-temp cutout circuits to trip or worse, cause the heating elements to burn themselves out. One of the most common mistakes is to burn out a heating element by not purging the loopfield and cube properly prior to turning on the heating elements. Precision Geothermal offers an optional "H" valve assembly for making it easy to properly purge a system prior to starting the test but even this requires that the operator take proper steps to eliminate air from the system. Just like running an engine without oil - running the GeoCube heaters without properly proper purging is a near certain guarantee of damage or shortened life. Your GeoCube is an investment worthy of proper care and operator training. With proper operation, your GeoCube will provide years of reliable service. GeoCubes (with the redundant sensor option) shipped after October 1, 2013 now feature redundant sensor wells in the fluid flow instead of the pipe mounted sensors in earlier models. Extended Range GeoCubes feature an external panel for access to heating elements and a stainless steel heat exchanger manifold. The driller introduced mud and sand into the test loop. How can I protect the GeoCube? Precision Geothermal has repaired a number of units that were returned after failure due to gravel and sand clogging the pump and causing damage to the pump and the heaters. The current product design now incorporates a built in, cleanable, stainless steel filter assembly. This filter will catch sand and gravel before it can get into the GeoCube and will help prevent damage from sediment that was introduced by the driller or through vandalism. Older units will also accept the new filter system and may be field upgraded by ordering a replacement filter assembly. Our filter is rated nominal 140 micron and will stop particulates .0055" and larger while allowing for full rated pump flows.